This month’s Throw Back Thursday is inspired by the change of season and the definite chill in the air. 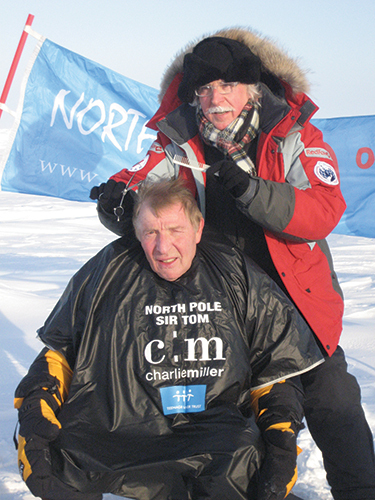 In 2010 Sir Tom Farmer invited his friend Charlie Miller on his expedition to the North Pole and officially became the company’s coolest client when Charlie cut his hair for the Teenage Cancer Trust. Interviewed by the BBC about the trip Charlie said ‘”I was cutting Sir Tom’s hair and he asked me if I would go, I looked at him for three seconds and the boy in me appeared and I said ‘yeah’. Once at the Pole Charlie kept his gloves on to avoid frostbite. Sir Tom removed his hat to brave the severe conditions and was given a super fast trim in temperatures of minus 35 degrees. The haircut was a world’s first and the adventurous trip raised significant funds for a very worthy cause. 2010 was also the year that Charlie Miller opened it’s fifth salon at Holy Corner, realising its dream of launching a training academy for industry peers. Led by salon manager Amber Swift, you’re guaranteed a warm welcome when you step inside this winter. Book online today. Find out more about our 50th anniversary celebrations by searching hashtags #50YrsTogether and #cmhairdressing on Facebook, Twitter or Instagram and remember to pick up your complimentary copy of our Magazine next time you visit any of our five Edinburgh salons.